Announcing the Science Museum Studies Master's Program at CGP! Founded in 2015, the Science Museum Studies program provides an environment where participants get hands-on experience in communicating science to the public in a diversity of science venues and organizations. Project oriented and collaborative in nature, the program facilitates a deep understanding of the process of science and develops the skill sets required for working in today’s science venues. For more information, course descriptions, and examples of projects and content, please visit Our CGP Science Website or contact Carlyn Buckler, PhD. at carlyn.buckler@oneonta.edu. The Cooperstown Graduate Program (CGP) is the premier program for the training of museum professionals in the United States. One of only two programs in the country located on a museum campus rather than a university campus, students have the opportunity to interact regularly with museum professional staff, with objects, and with exhibitions. The Cooperstown Graduate Program trains creative, entrepreneurial museum leaders committed to generating programs and services for the public good. Our alumni are prominent and successful in the field, and regularly give back to the program. The classes are small, dynamic, and interactive. Our building is the country’s only facility designed specifically for museum studies. We teach a core generalist curriculum, though with room for personal interests. Assignments and internships are not academic exercises, but real and varied work in the field. Classes are complemented by field trips to regional institutions. Museums are community-based organizations, and CGP mirrors this with a strong focus on community. We have strong partners in the New York State Historical Association, The Farmers' Museum, and Fenimore Art Museum. As a small program, students develop strong relationships with faculty, fellow students, and local museum staff. Learn about the Institute for Cultural Entrepreneurship, an immersion program for mid-career museum, preservation, historic site and other arts and culture professionals. Professor Gretchen Sorin works in the exhibit lab with Ryan Donaldson ('07) and Valerie Aquila ('06). In the Spring 2011 semester, the Cooperstown Graduate Program set a new standard for professional training in museum studies with a brand new facility. The new CGP facility is very student friendly. The renovated building provides students with a media lab equipped for oral histories and film editing, a "smart classroom" with the ability to project movies and conduct video conferences, a space for large receptions, and a cozy student lounge overlooking Lake Otsego. The lounge is outfitted so that students can view movies or just relax and study or eat lunch. There is also a lab for the examination of objects and a lab for building exhibitions. Just a short walk from the main school building, the NYSHA Library serves CGP as well as the public. Each student receives an individual carrel and has secure access to the library 24-hours a day. The library has a strong collection of books related to museum studies and New York State, as well as significant holdings in special collections. The experienced staff provide assistance with research, and the ability to make inter-library loans from other institutions. 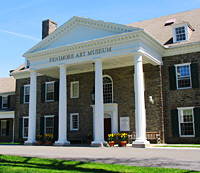 Located next door to the library, Fenimore Art Museum is respected nationwide for its collections, particularly for Folk Art and the Thaw Collection of Native American Art. The NYSHA photo collections can also be a useful resource for CGP students. Museum staff often give advice on projects, and many students are able to undertake internships or help out during exhibit installations. 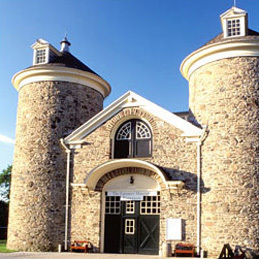 Across the street from the Fenimore, the Farmers' Museum is an open air living history museum. It includes a farm and village of historic structures, as well as costumed interpreters representing various trades. The museum contains live domestic animals, including many heirloom breeds. The Farmers' Museum provides students the opportunity to learn the basics of hands-on crafts, such as blacksmithing, weaving, and open-hearth cooking. Staff are happy to share their knowledge, and the museum provides a location for numerous projects and internships. ISF serves as the primary collections storage facility for NYSHA and the Farmers' Museum. Housed in a former stable, it contains a large and varied collection. Especially prominent are tools of rural life, and items relevant to state and local history. The focused staff are helpful, and the collections provide a real-life opportunity to practice study, care, and management skills. The storage facility includes a classroom, which is used for many collections-focused courses. About a half-an-hour to the south, the Oneonta campus provides a fully-equipped collegiate environment. 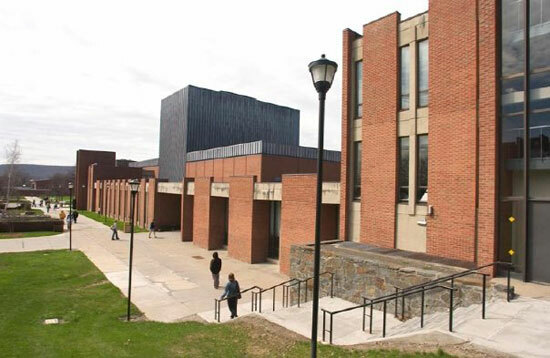 This includes the Milne Library, Health and Wellness Center, and the school's administrative offices. Other campus opportunities include athletics, clubs, and events such as concerts and shows. 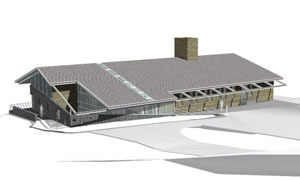 Architect's design of new CGP facility. Students study an object at ISF.